The Web Scanning Demo is comprised of a web site (client) and an executable (service). 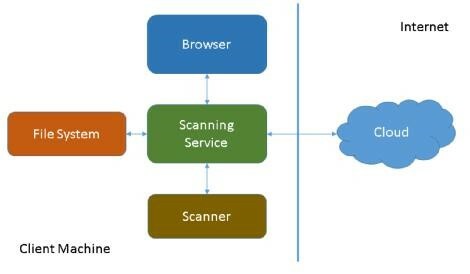 Below is a diagram of the entire system working with a scanner, file system, and the cloud. The source code for the executable hosting the scanning service is provided so you can add additional libraries as needed, brand the EXE as necessary, and package the executable using a packaging software of your choice. The viewer contains a thumbnail list of each page scanned. It resides to the left of the main viewer. After the user has finished scanning and editing the images, they can be saved to the client's local drive or saved to memory. Once saved, the file can be sent to a server such as Microsoft's SharePoint, Microsoft's One Drive, Google Docs, etc. The main benefit of this system is that it allows you to maintain one code base that works across all browsers supporting HTML5. Currently LEADTOOLS only supports scanning, using TWAIN, on Windows operating system and using SANE, on Linux operating system. 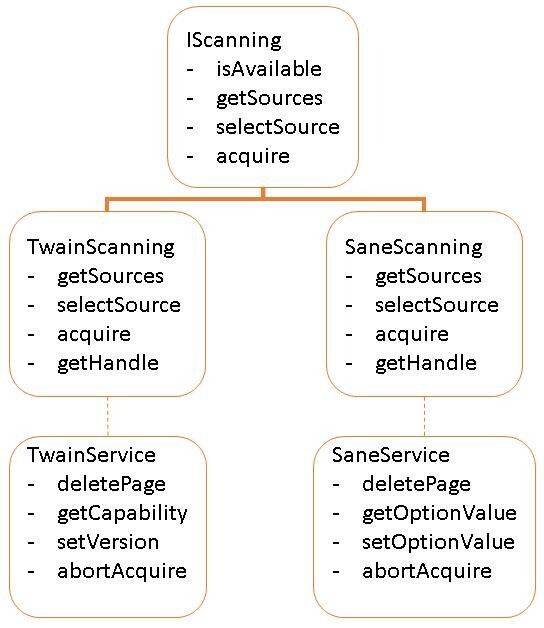 Use either the TWAIN 1.X library (twain_32.dll) or the TWAIN 2.X library (TwainDSM.dll). Some legacy scanners do not work well with the newer TWAIN 2.X library. Additional features, such as obtaining scanning status, are available as well. The Scanning Service relies on LEADTOOLS libraries to both communicate with the TWAIN device and to provide image processing features. The LEADTOOLS libraries are distributed as part of the Scanning Service installer. For instance, you may want to add code to save all scanned pages to a file in memory, then use a 3rd party cloud storage API to store the file to the cloud. Or you may just want to allow a user to save a copy of the scanned pages to their local machine. This is the Windows Application project that references, hosts the Scanning Service, and holds the code for the Image Processing and Command Callback functionality. The code for the application exposes the host class allowing for adjustments to the URL, port number, and protocol (HTTP/HTTPS) the Scanner Service will be listening under. You can adjust the bindings and endpoints as necessary as well. After installation, the Leadtools.WebScanning.Host.exe runs as a Windows Application, but hidden from view. The user will see it appear in their system tray as an icon. The icon can be replaced with your company's brand. The user can right-click the icon and select to close the application, or open a dialog displaying an option to have the application start up whenever Windows starts. This dialog can also be modified to add additional settings and branding as well. The Leadtools.Scanning.js code contains an IScanning interface as well as the TwainScanning and TwainService implementations to provide TWAIN-specific functionality. The most predominantly used TWAIN constants have also been defined to allow for IntelliSense programming within Typescript. Because the source code to this demo is provided, modifications to the "look and feel" of the page can be performed as well as adding further functionality. The installer project allows you to build the *.msi file which contains the Scanning Service and its required dependencies. Use this project to add additional dependencies you may need to deploy with the Scanning Service. For instance, if you add additional image processing features, you may need to deploy additional LEADTOOLS image processing libraries with the Scanning Service. Portions of the API for this system are documented within LEAD's Online Documentation. Other portions are not documented because the source code to the component is provided. The documentation for the Leadtools.Services.Twain Assembly and the Leadtools.Sane Assembly can be found online. The following sections describe the portions of the provided source code that are the most relevant to the functionality of the system. The IScanning interface defines the basic functionality for the Web Scanning framework. Deriving from IScanning, this is the TWAIN implementation class. This class uses the TwainService class to send the message to the Web Scanning Service. The function descriptions for this class are the same as the IScanning. Although the class does not derive from the IScanning interface, it provides an implementation for each of the functions. The class essentially is a proxy class as it builds the command that is sent to the Web Scanning Service. It also contains TWAIN-specific functionality such as retrieving and modifying a scanner's settings (known as capabilities). 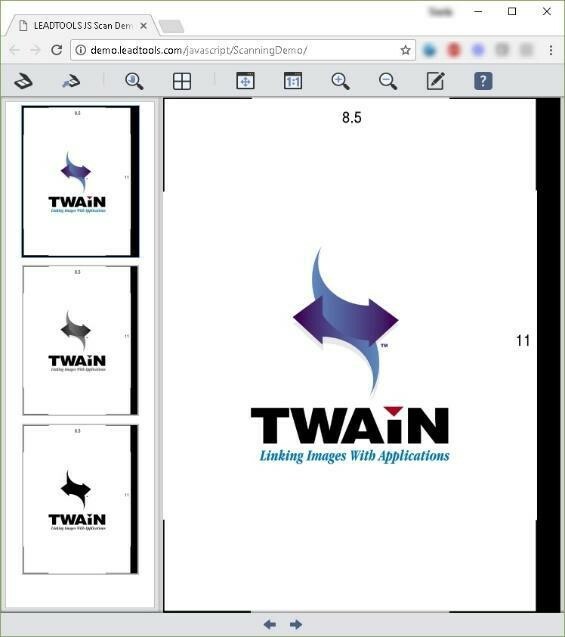 setVersion Allows selection of the version of the TWAIN library that is used by the Web Scanning Service. By calling this function with Version 1, the Web Scanning Service will attempt to use the twain32.dll. By calling this function with Version 1 the Web Scanning Service will attempt to use the TwainDSM.dll. Deriving from IScanning, this is the SANE implementation class. This class uses the SaneService class to send the message to the Web Scanning Service. The function descriptions for this class are the same as the IScanning. Although the class does not derive from the IScanning interface, it provides an implementation for each of the functions. The class essentially is a proxy class as it builds the command that is sent to the Web Scanning Service. It also contains SANE specific functionality such as retrieving and modifying a scanner's settings known as options. This web application provides the user interface for the system. It communicates directly with the Scanning Service where all actions are initiated by the user. In the Main.ts file the function selectSourceBtn_Click first obtains a list of scanners installed on the machine using the _scanningService.getSources function. This function will send a request to the Scanning Service which will use the LEADTOOLS Twain API to obtain a list of TWAIN scanners installed on the machine. After the list of scanner names is obtained, a UI element is populated with the names and a dialog is presented to the user. When the user selects a scanner name, the code in Main.ts (under #selectSourceDialog) is called, where _scanningService.selectSource is ultimately called, passing in the name for the scanner. In the Main.ts file the function scanBtn_Click first calls the _scanningService.acquire function to begin the scanning process. The default behavior is to show the manufacturer's dialog for the scanner; this is the first parameter in the acquire function. When the acquire function returns, all pages will have been scanned and saved in a temporary cache. You have access to each image using the _scanningService.getPage function, which returns the location of the page in the form of URL. This allows minimal code to assign each page to HTML image elements. You can also remove a page from the cache using the TwainService.deletePage function. In the Main.ts file the _scanningService.applyImageProcessingCommand function sends a request to the Scanning Service and end up in the Image Processing event for the Scanning Service. The applyImageProcessingCommand lets you specify a starting and ending page as well as to process multiple pages in one function call. Although not found in the demo, the _scanningService.runCommand function allows you to send a command name and parameters to the Scanning Service, along with any user data. The Scanning Service receives the request in an event with the event arguments containing each of the parameters. You then have the ability to do something with the data using your own custom code. The _scanningService.getHandle function allows you to obtain a reference to the underlying TwainService class the TwainScanning class uses. This allows you to make calls to the TwainService using functions specific to the service. These functions include abortAcquire, getCapability, setCapability, deletePage, and setVersion. Sample code for how to use this function can be found within the Scanning Demo project in the Main.ts file. Search for getTwainCapability to find the function. Sample code for how to use this function can be found within the Scanning Demo project in the Main.ts file. Search for setTwainCapability to find the function. If you receive this error, follow the directions at the specified link in the error to resolve it. The solution has been tested with a user from the "PowerUsers" group as well as a user from the "Users" group. After registering the URL with each user, the user was able to scan from the Leadtools.WebScanning.Host.exe without any issues using the sample web page that ships with the toolkit.